When this photo was taken, the Main Street bridge over the RR tracks was almost brand new. It crossed over the double tracks of the main B&M line from Boston to Fitchburg (on the right) and the single track Marlborough branch (on the left). A 2 car train from Marlborough has pulled up to the South Acton station on the right. The conductor is standing on the station platform on the right. At the time of this photo, up to 15 scheduled trains a day used the Marborough branch. 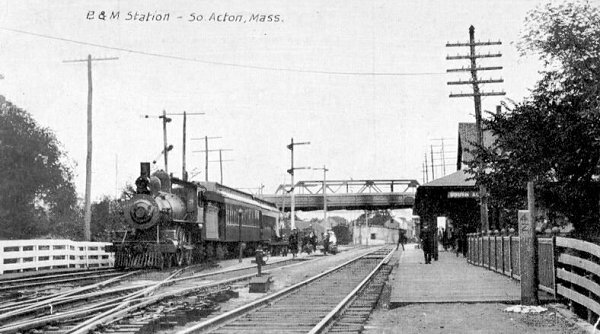 The South Acton station was built in the late 1800's and was used for passenger traffic until the early 1970's. 2001 The new photo shows another brand new bridge across the tracks, the 1999 concrete replacement of the original. A lot has changed in 89 years. The 4 tracks (Marborough, siding, east & westbound Fitchburg) are down to just 2 (siding & MBTA). The train station was sold off and eventualy burned down in 1984. The concrete waiting platform for the station is still visible on the right. One last detail still lingers from the past. The same white plank fence is in both photos, on both sides of the tracks.